Forty architects from 20 countries entered their projects into the prize in 2018. 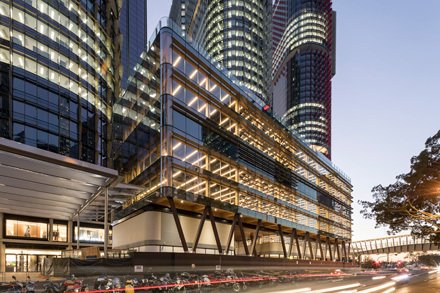 After a live presentation of the nine shortlisted projects, a jury of three experts, including architect Mark Thomson, chose International House in Sydney, designed by Tzannes and developed by Lend Lease, as the winner. With its seven floors, International House is the world’s tallest all commercial building constructed fully from engineered timber. It catches the eye with its clear glass façade and, with its very low carbon outcome, sets new standards in sustainable construction. All projects entered for any of the 17 ‘Completed Buildings’ award categories are eligible for the Best Use of Certified Timber Prize and you do that by checking a box titled “Please consider me for Best Use of Certified Timber Prize” under “Enter into additional WAF Prizes”. The use of certified wood products is a precondition for entering and during the submission process, you will be asked to provide details on the percentage of certified material used on your project. The 12th World Architecture Festival will take place in Amsterdam from 4-6 December 2019. After hearing presentations of the 10 best entries in the morning of Friday 6 December, the jury will announce the winner at a dinner in the evening. The deadline for entry is 3 May 2019.